I purchased this from Elsie Sampson from Chinese Sweatshop. 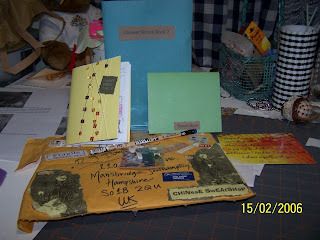 The yellow book with the thread and the blue behind are the drawing zines. They are wonderful. She draws and tells you stories about how she started drawing and what she likes to draw etc. The green book is a sketch book and she added the pencil, 2 crayons and other bits and pieces to draw on. It is wonderful and worth a look. She has other zines also at her webpage. I found her through Croq zine. Her zine is so original though. She cuts and pastes and handpaints color. It is a wonderful inspiration.